Injustice: Gods Among Us – Game of the year edition – is all set to release on November 6TH, 2013 according to Amazon’s French domain. The product has been obviously pulled-out by now, but ABG did manage to get a screenshot of the web page. Although this edition of the game has not been officially announced yet, we do believe that it will release on Sony’s Playstation 3, Playstation Vita, Nintendo Wii U and Microsoft’s Xbox 360 along with Microsoft Windows. It makes sense because NetherRealm’s previous game Mortal Kombat also released on home consoles first before making its debut on Playstation Vita and on Microsoft Windows. Although Amazon did not provide us with any kind of other details as to what we will get with this edition, we do hope that it will include all the DLC released up to this point. As of now, NetherRealm has launched Lobo, Batgirl, General Zod and Scorpion as downloadable characters along with many costumes for different characters. Injustice: Gods Among Us is a fighting game developed by NetherRealm studios and is primarily based on DC Universe characters. The game is developed on Unreal Engine 3 and is available for Playstation 3, Xbox 360, Wii U and iOS. Are you happy with more fighting games being ported to Microsoft Windows? Do let us know in the Comments Section below! 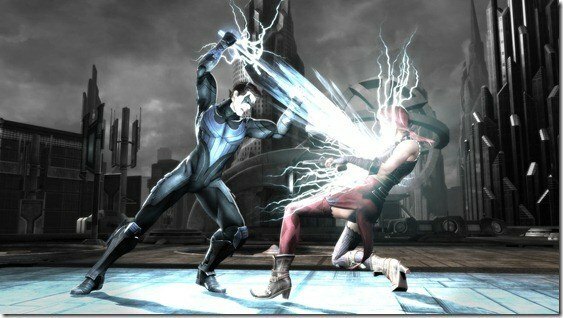 Injustice: Gods Among Us 2 Coming Out Next Year? Injustice: Gods Among Us Getting a Sequel in 2015?